I’ll be honest, for no real reason, I’ve been sleep on H&M as of late.🤷🏾‍♀️ But when I found this cute and breezy floral set on their website I knew I needed it for the beach and the soon-to-come warm weather in general. The super breathable fabric is ideal for a humid climate without compromising on cuteness.💯 In addition, the matching shorts include actual, functioning pockets! I mean come on, we all know that’s a major benefit with any closet staple. To make things even more amazing, this pretty little set totals out at less than $30 , meaning you can save them coins💰 while still looking like money, sis! Alright look, if you haven’t dropped this set into your cart just yet and you need a little more convincing, there are a few other reasons why you should invest in this affordable ensemble for the months to come. Issa set, which means versatility. ♻️ Y’all already know my protip for ensuring that your money is well spent when it comes to co-ord sets. These two pieces are cute enough to wear separately or together for a range of outfit possibilities. It’s ideal for spring and summer. 🌤That’s right, bb! You can get two seasons of wear out of this cute co-ord for one price. This means you can rock it to spring break, on a summer vacay, or anytime the weather is fine. It’s under $30. 🛍Let’s be clear, that’s taxes and shipping included, okurrr?! Get your life and get this set. Sunkissed ain’t even the word, chile! Shoutout to Neutrogena sunscreen for keeping me radiant. If you’re like me and you’re ready for spring to pull up on you, these additional floral feels from H&M are guaranteed to keep you looking fresh, feminine and fabulous while things heat up. 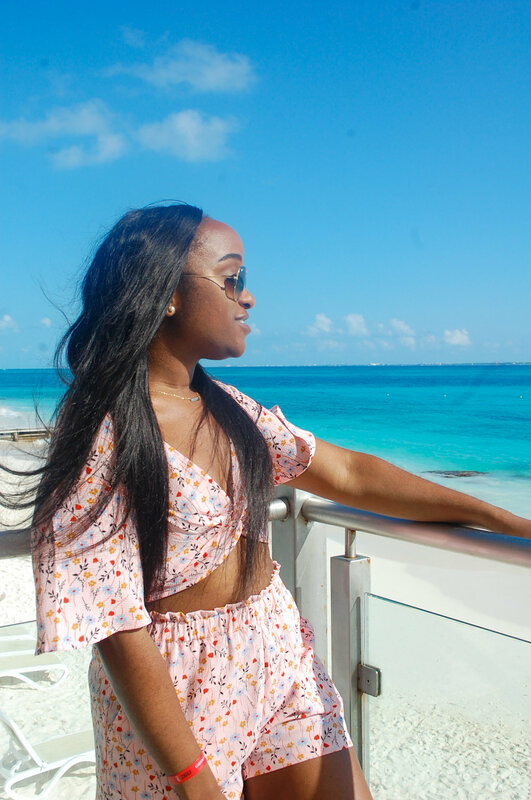 Let me also take a moment to give y’all the scoop on my fresh bundles I got installed just in time for vacation. I recently teamed up with local, Austin-based hair boutique Glam Hair Only and let me tell you, these bundles are it, chief. 🤪 Because I’m beyond extra, I opted for both a 20” and 22” bundle and a 16” lace closure that is literally the best blending piece I’ve ever worn.💁🏾‍♀️ Use my code ‘PAIGE10’ for some 💸 off and try the bundles for yourself, queen! Y’all should know by now I’m not finished with the vacay looks.🤫 I’ll be back on the blog soon (maybe even later this week) with a saucy bikini you need to spice up any beach you land on this spring or summer. Sit tight and happy shopping!